NEW!! Aircraft Landing Gear / Gear Door Squat Switch. P/N MS25040-3 or H1-8 or MIL-S-8805/50. 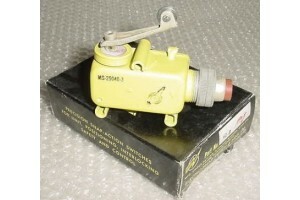 New / nos Aircraft Landing Gear / Gear Door Squat Switch. Manufactured by Electro-Snap Switch & Mfg Co. P/N MS25040-3 or H1-8 or MIL-S-8805/50. NSN: 5930-00-669-7344.